In the broadest sense possible, a civil war is a war between citizens of the same country. 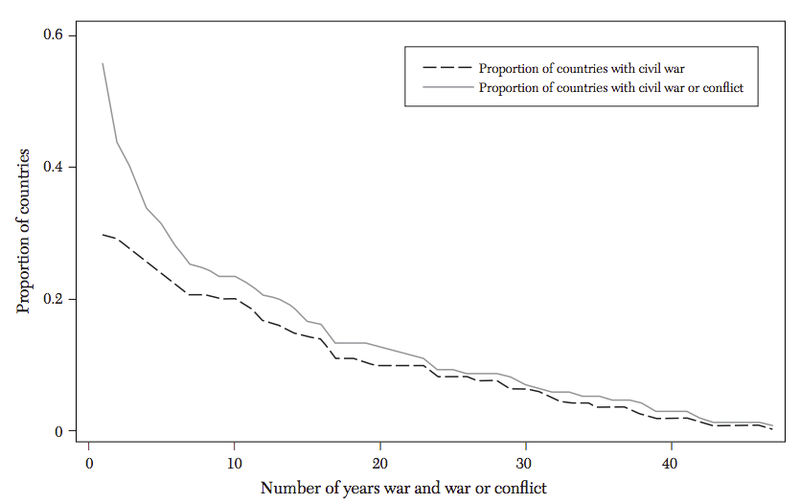 With the collapse of the European empires after the Second World War, instances of civil war increased globally while Europe remained relatively conflict free. Civil wars are often characterised as more brutal conflicts with a greater number of casualties. Understanding the causes of civil conflicts has become an increasingly important line of research given the destructive and frequent nature of civil conflicts. 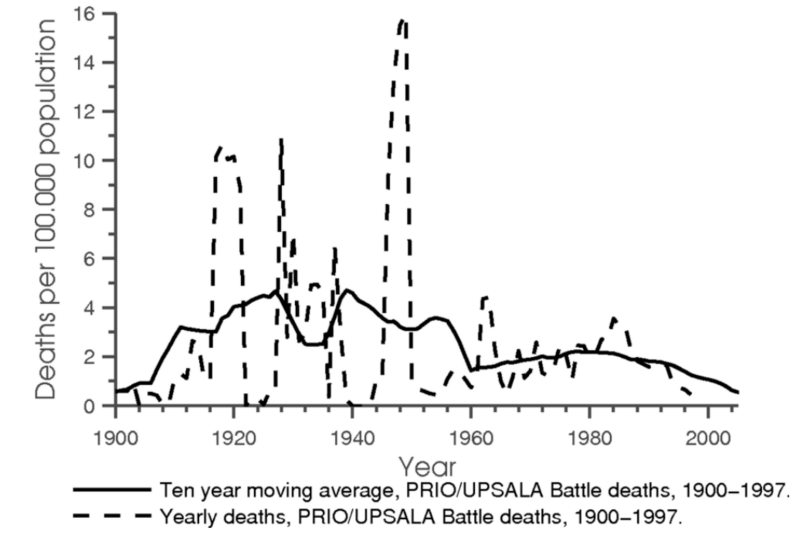 Over the course of the 20th century, the deaths from civil wars (as defined by PRIO-UPSALA dataset) first spike at the end of the First World War, and flare up again in the interwar years as well as the end of the Second World War. The end of the WWI saw the collapse of the Ottoman, Autro-Hungarian, German and Russian Empires, as well as the beginning of the end of the remaining European powers. The collapse of the Russian Empire in 1917 led to the Russian Civil War and the deaths of millions of people. What is more, many modern conflicts in the Middle East (both civil and conventional wars) have their roots in the division of the Ottoman Empire. The prevalence of internal war in the 1990s is mainly the result of an accumulation of protracted conflicts since the 1950s rather than a sudden change associated with a new, post-Cold War international system. Decolonization from the 1940s through the 1970s gave birth to a large number of financially, bureaucratically, and militarily weak states. 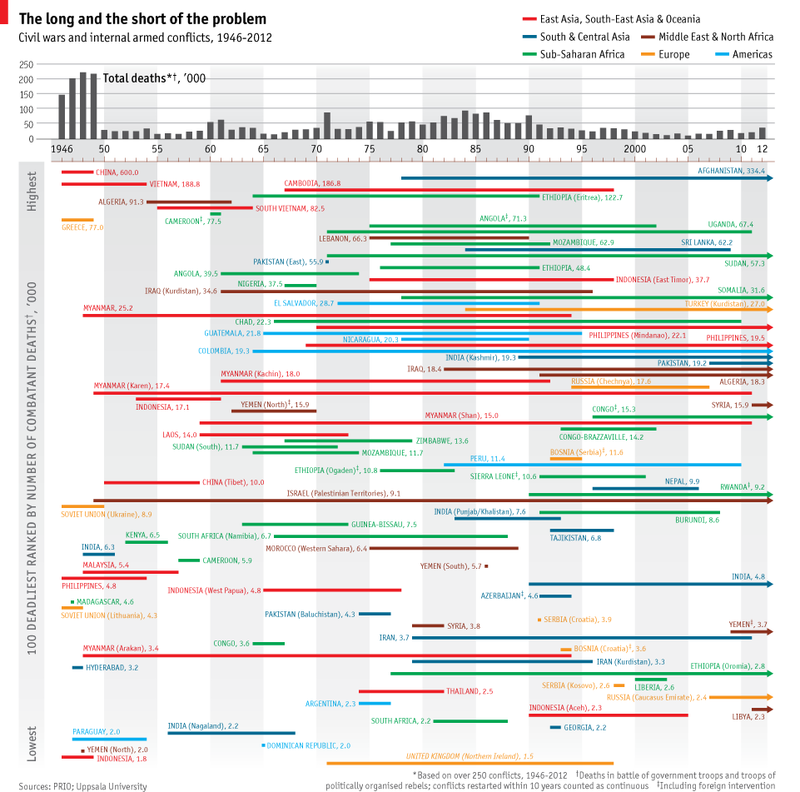 The following visualisation from The Economist displays a ranking of the 100 deadliest civil wars and internal conflicts since WWII. 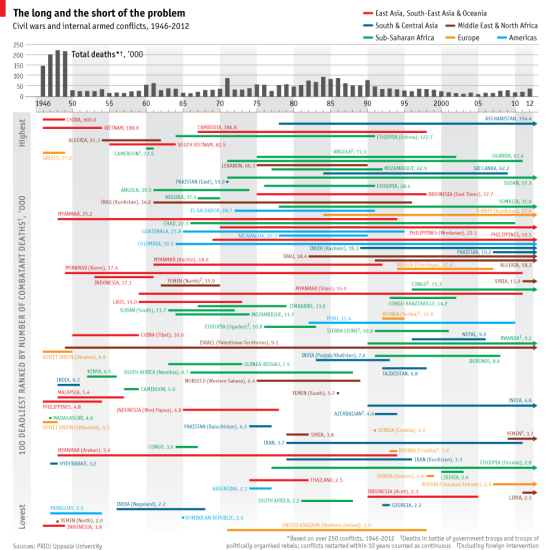 This chart neatly displays the variance of civil wars; many conflicts are relatively short-lived but some have lasted decades; the deadliest civil war had 600 combatant deaths per thousand while the lowest ranked conflict had only 1.5. This graph and the preceding one together show just how common internal wars are and the high degree of persistence in these conflicts. 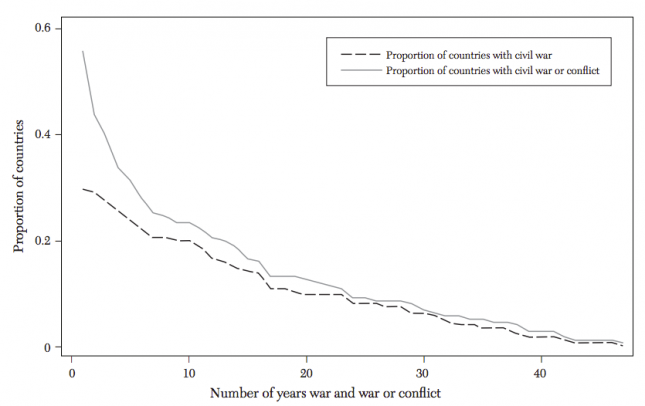 Between 1960-2006, Blattman and Miguel estimate that 20% of nations have experienced at least ten years of civil war. Another factor to consider is the number of new countries established during the postwar period. The breakup of the remaining empires after WWII led to the establishment of new &apos;independent&apos; states. The following chart shows the increase in the number of nations and constitutions between 1789 and 2013. One of the most influential studies on civil war argues that the causes for such conflicts are primarily economic and not grievance based. This theory rejects the idea that civil wars are caused by ethnic, religious or other socio-demographic factors. Instead civil wars are the result of rational individualistic assessments of the costs and benefits of conflict as well as the likelihood of success. 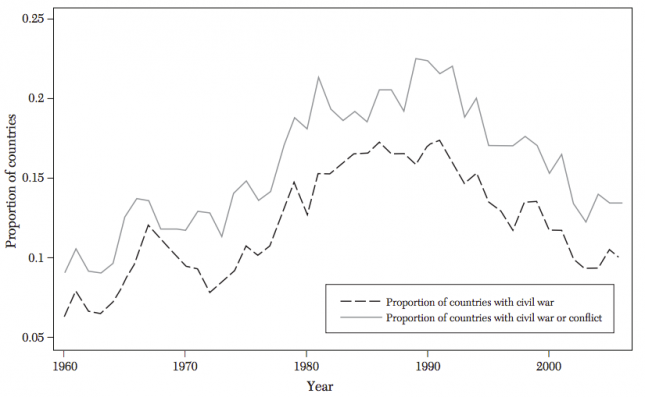 The economic gains from conflicts are often control of resources and political power. James Fearon and David Laitin agree with Collier and Hoeffler&apos;s general analysis that economic factors are the main drivers of civil conflicts, but suggest that insurgency plays a large part.8 Fearon and Laitin define insurgency as "a technology of military conflict characterized by small, lightly armed bands practicing guerrilla warfare from rural base areas." Fearon and Laitin characterise most civil conflicts as the result of weak and corrupt governments fighting insurgencies protected by difficult terrain (mountains, desert, jungle) and a sympathetic population. In many cases, these insurgencies are supported by foreign diasporas or sympathetic groups and the revenues generated from appropriated commodities. The Correlates of War (COW) project produces the most comprehensive and widely used dataset on civil war. A basic requirement for classification is that: "intra-state war must... involve sustained combat, involving organized armed forces, resulting in a minimum of 1,000 battle-related combatant fatalities within a twelve month period." When the government is involved as an entity in the conflict, it must either commit 1000 troops to the war or suffer 100 battle-related deaths. The threshold for non-state armed groups is lower at 100 armed personnel or 25 battle-related deaths. Full details on the classification rules can be found in Inter-state Wars (Version 4.0): Definitions and Variables by Meredith Reid Sarkees. Acemoglu, Daron. The world our grandchildren will inherit: the rights revolution and beyond. No. w17994. National Bureau of Economic Research, 2012. Available online here. Fearon, James D., and David D. Laitin. "Ethnicity, insurgency, and civil war." American political science review 97, no. 01 (2003): 75-90. Available online here. Blattman, Christopher, and Edward Miguel. "Civil war." Journal of Economic Literature (2010): 3-57. Available online here. "How to stop the fighting, sometimes." The Economist (2013). Available online here. 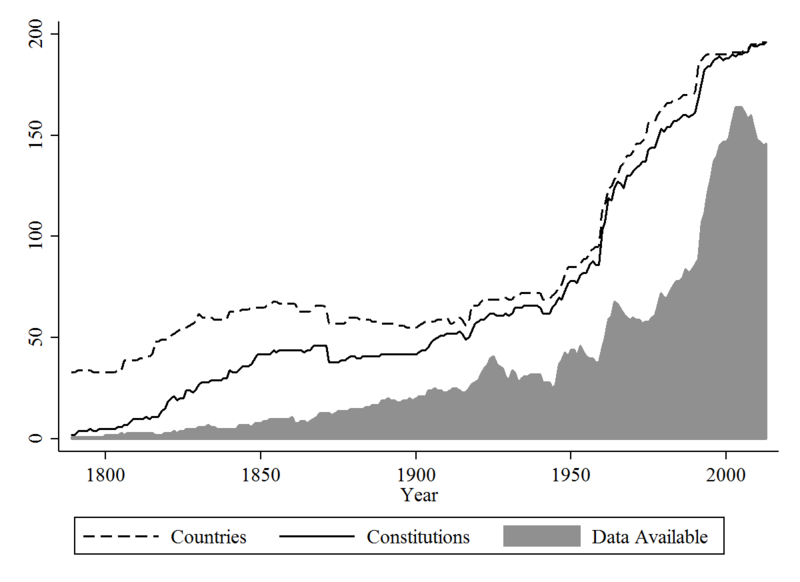 "New Data Available from the Comparative Constitutions Project." Constitutions Unit (2014). Available online here. Note: Data availability refers to the dataset produced by the Constitution Unit. Collier, Paul, and Anke Hoeffler. "Greed and grievance in civil war." Oxford economic papers 56, no. 4 (2004): 563-595. Available online here.